At Luxdentic we provide a full range of pedodontics treatment in environment that is friendly to small Patients. 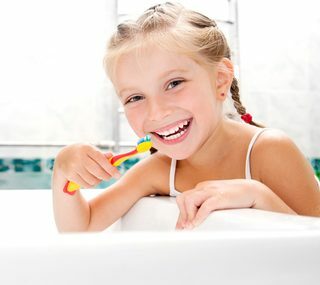 Pedodontics at Luxdentic is the care of your child’s oral health. It is also education through play&fun how properly take care of small teeth! We do all this because the health of the child and his milk teeth is not without effect on the proper development of permanent teeth. What we often forget. Milk teeth, like permanent teeth, can be attacked by caries, which, if untreated, lead to unpleasant and painful inflammation of the pulp. We treat tooth decay in the same way as in case of permanent teeth – by removing sick tissues and filling cavities. It is cool at the dentist’s! Would you believe that the child would gladly go to the dentist? It shows that yes, provided that the first adaptation visit is properly organized and carried out. Children are usually very interested in the world, new places and situations. They ask a lot of questions and because of their age they are not forewarned. The dental office is such a new world for them, a new environment. An adaptation visit aims at getting familiar with a dentist, dental chair and dental tools. From the child’s point of view, such action allows to tame a new situation in his life. At Luxdentic dental offices, adaptation visits for children are pure fun. Children are watching educational stories showing them how to take care of their teeth, they learn how caries looks and the braver ones can widely smile at the intraoral camera and show their teeth sitting at dental chair. Each participant of such visits also gets a special diploma of a brave patient. During such visit, our specialists will check the condition of child’s teeth, heal the sick teeth, teach how to properly care for teeth hygiene and inform parents what to pay special attention to. We encourage you to use consultations during an adaptation visit. Parents with children can make an appointment via the contact form at https://www.luxdentic.pl/en/contact-us/ or by phone: +48 530 330 530. Since October 2012, the Luxdentic Dental Clinic has been a continuous participant in the National Program of Health Education for Preschoolers called “Aquafresh Academy”. Also this year! The program is a response to a significant social problem, which is tooth decay among children. A statistical six-year-old has an average of 5 teeth attacked with caries, of which only one of them is healed! As part of the Aquafresh Academy program, our doctors at the Luxdentic Dental Clinic focus on dental prevention of pre-school and school children. Our goal is to create among children the need and habit of caring for oral hygiene, and as a consequence to reduce such a serious problem, which is caries among children in Poland.